The advantage of this type of reactor is that it does not require fuel enrichment; it is used mainly in Canada, Argentina and India. Heavy water that is heated in the reactor core is kept under pressure to prevent it from boiling. Device that uses heat from the coolant to turn water into steam to activate the turbine. Device that keeps the coolant water at a preset temperature to prevent it from boiling. Steam from the generator is carried to the turbine and generator to produce electricity. Piping carries water from the condenser to the steam generator, where it is turned into steam. 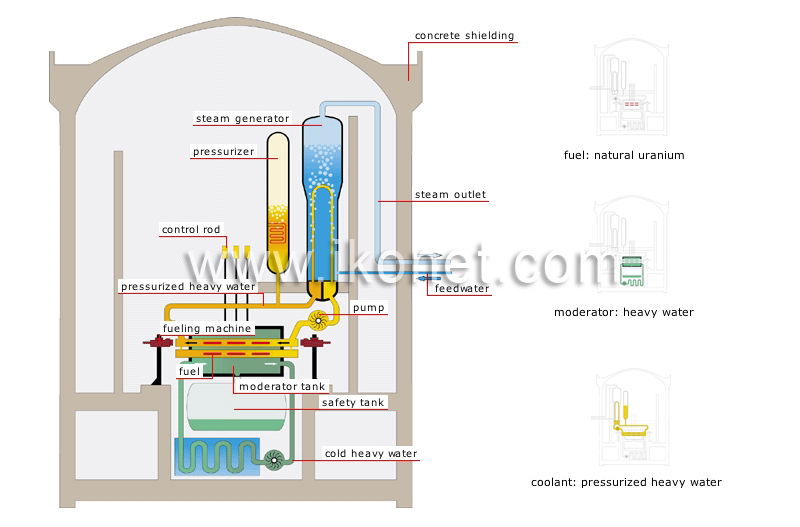 Apparatus that circulates the coolant fluid between the reactor and the steam generator. Tank where cold heavy water from the moderator flows to stop fission reactions in the event of an emergency. A pumping system ensures that heavy water around the moderator tank circulates, cools and is purified. Matter that is placed in the reactor core; it contains heavy atoms (uranium, plutonium) from which power is extracted by fission. Steel tank that contains cold heavy water from the moderator. Heavy water: water consisting of heavy hydrogen (deuterium) and oxygen; it can slow down neutrons. Heavy water is kept at a set pressure to prevent it from boiling.